I don’t often feature photos of me or my family. Today we get one and I am the beast of burden. My burden, the most precious of loads, is my son carried in front and my daughter in the rucksack on my back. 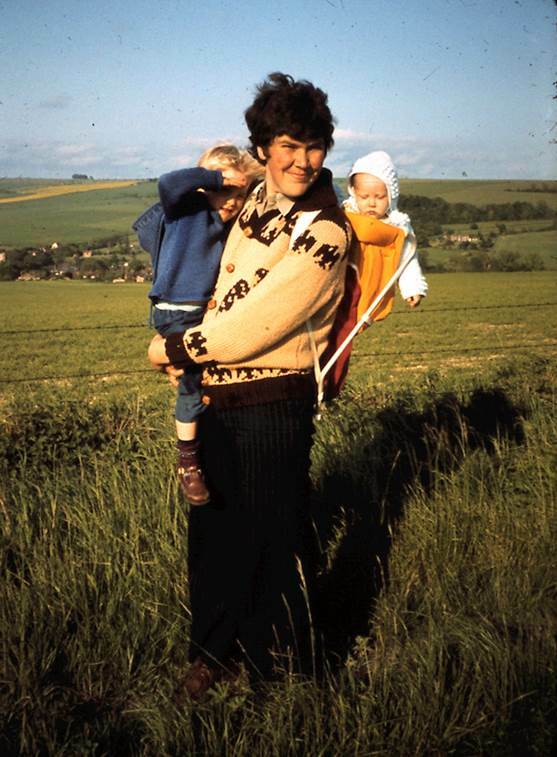 The location is the Wiltshire downland near Avebury and the year is 1981. But do you know what – it’s that cardigan I’m wearing that I’ll talk about. My mum found that cardigan and she felt certain she knew who it belonged to. At that time, our neighbours had a young lodger called Joe. Joe was a somewhat wild, but lovely, caring young man. He drove a rather flashy car – I can’t remember the make but he had equipped it with a horn that played the opening of the Colonel Bogey March. There were no words on this horn, of course, but most of us knew the version and happily sang out the somewhat rude words. Joe always announced his arrival home with a blast on that horn. And mum felt sure that this eagle emblazoned cardy was definitely Joe’s. We all agreed with her. We’d all, we were sure, seen Joe wearing it. But Joe denied all knowledge of it. So mum had a problem in the shape of a cardy she had picked up and brought home and now with no knowledge of the rightful owner. Eventually, it passed to my brother and we saw him wearing it from time to time. Then when he fell victim to cancer in 1980, it was passed to me. And I wore it, more in memory of my brother than of mum, although I always thought of Joe as well – when I wore this item. Of course, I still have it, but a more fully developed midriff means I don’t actually wear it. But hey! Didn’t I look a handsome chap back in 1981! This entry was posted on July 29, 2014 at 5:02 am and is filed under past times, Travel. You can follow any responses to this entry through the RSS 2.0 feed. You can leave a response, or trackback from your own site.